This story is brought to you from one of our face book followers and former RAF pilot Brian Payne. If you have any similar stories or original photographs please let us know and with your kind permission we will publish them on this web site and share with our worldwide T6 Harvard community. I only have the attached photos taken by my friend and fellow course member Chris Chesters at Moose Jaw. All were taken at the end of basic training in October 1954. The only times I flew 3302 solo in a 4 plane formation was on 12 and 13 October so we can date them pretty accurately. The instructor is is in the 4th Harvard with Chris. The ground pictures taken at lunch time show a typical days complement of yellow perils ready for the afternoon’s fun. Basic training on the T6 took 36 weeks and amounted to190 hours. There were four FTSs and new courses started every six weeks. Until Summer 54 you got your wings at the end of the course but we had to do another 80 hours of jet training at 3 AFS Gimli to get ours. With hindsight I regret not being a photographer but the object of the exercise was to learn to fly and there were plenty of other distractions in Canada in those days! However aerobatics round cumulus clouds in a T6 is hard to beat. I lost touch with Chris after 1956 but I’m sure he would not object to you using his pictures with mention of him. We had a unique status in Nato flying training. Although we were all acting pilot officers we became flight cadets like our Canadian friends and lived in the flight cadets mess. The senior course ran everything. 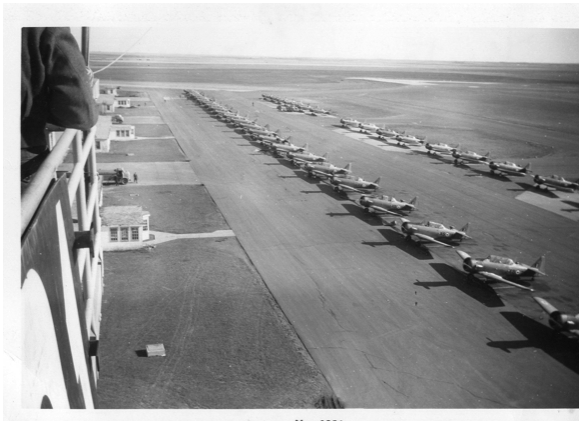 The declaration of World War II saw the Moose Jaw Flying Club initially contracted to provide pilot training for the Royal Canadian Air Force, however this was soon replaced by the far larger British Commonwealth Air Training Plan (BCATP) which saw the Government of Canada acquire the aerodrome and completely reconstruct it into RCAF Station Moose Jaw in 1940 with the new aerodrome opening in 1941. Initially the Royal Air Force trained exclusively at the base under the RAF’s No. 32 Service Flying Training School (SFTS) (ca. 1942) using Harvards, and later, Oxfords. No. 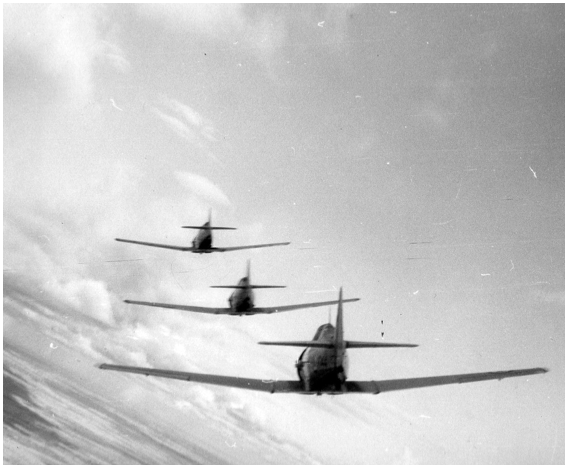 32 SFTS eventually broadened its intake to train 1,200 pilots for the air forces of Canada, the United Kingdom, Norway, New Zealand, Poland, France, Czechoslovakia, Belgium, the United States and the Netherlands. 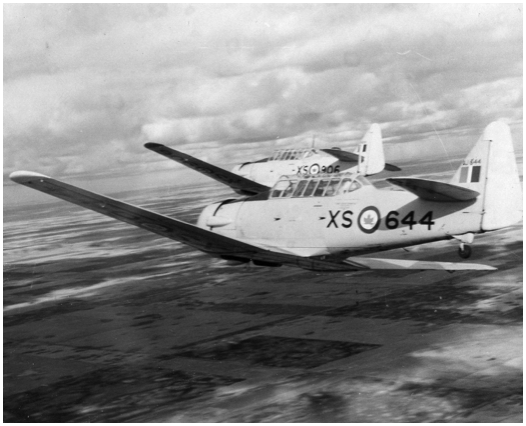 In 1946 RCAF Station Moose Jaw was decommissioned and the aerodrome was returned to civilian service after the war. The Institute for stained glass in Canada has documented the stained glass at RCAF Base Chapel. In 1968 the RCAF merged with the Canadian Army and the Royal Canadian Navy to form the unified Canadian Forces. The base’s name was changed to Canadian Forces Base Moose Jaw, usually shortened to CFB Moose Jaw. From 1968 until the formation of Air Command in 1975, CFB Moose Jaw fell under the direction of Training Command and served to house the Tutor Jet Training Program. By the early 1990s, CFB Moose Jaw was operated by over 1,300 employees and made a significant economical impact on the region, but pending cutbacks in military spending spread rumours of possible closure of the base. In 1994 Bombardier Inc. put forth a proposal to provide what is now the NATO Flying Training in Canada program. The proposal was accepted and eliminated all worries that the base would be closed. Many of the base’s structures were renovated to accommodate new personnel and new training aircraft. Pilots from Denmark, Singapore, Great Britain, Italy, Hungary, Germany, Finland and many other allied nations train at CFB Moose Jaw every year, ensuring the base’s future with the Canadian Forces.